This will quite possibly be the shortest post on our SE Asia adventure – good for people with short attention spans, but bad for people who want more info on each destination! With nothing but bad weather on the horizon for both northern and central Vietnam, and with the clocks ticking on our one-month visas, we decided to hurry things up a bit and start heading south. If you’re heading to Vietnam, you’ll need to get your visa before you arrive. For those who don’t have the time to go to a consulate in person, we recommend Vietnam Visa to help you arrange everything. Transport + accommodations in one ticket. After our one day exploring Ninh Binh, we took the overnight train bound for Hue. 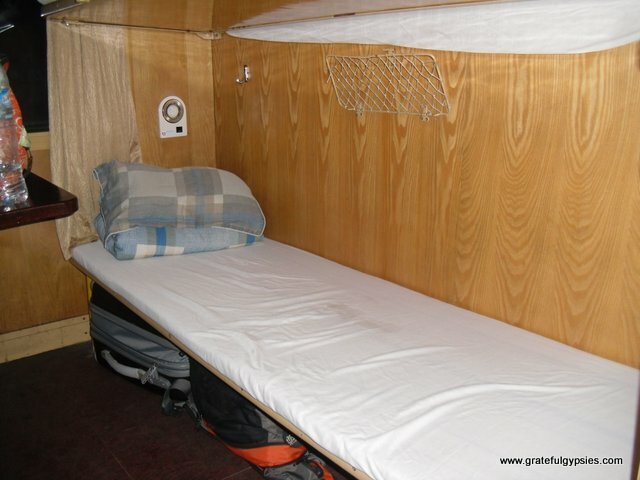 Although the train was double the price of the sleeper bus ($30 each vs. $15), it was money well spent. For one, we could actually fully stretch out on the beds; this is not possible on Vietnamese buses. Also, we lucked out and were the only two people in a six-bed cabin. We were able to kick back, enjoy some snacks and beers, and watch a little bit of TV without bothering anyone. The next morning, we arrived in Hue ready to rock. This was not the case in any spots where we got off an overnight bus; in both Hanoi and Ho Chi Minh, we arrived dead tired and in desperate need of a nap. If you should find yourself contemplating the same decision when traveling in Vietnam, take it from us – the train may cost you a few more dollars, but it may also save you half a day of recovering. 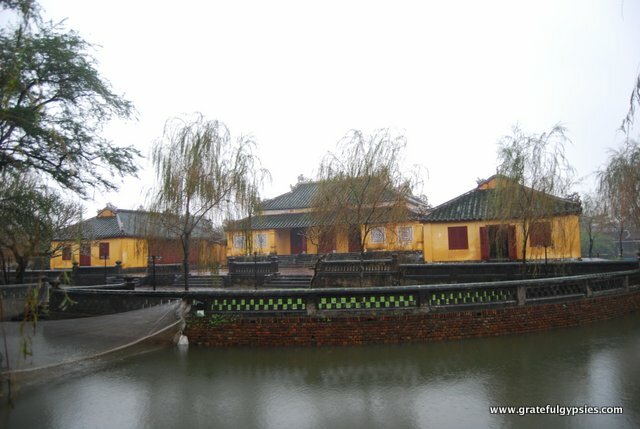 As a former capital during the Nguyễn Dynasty and a stop on the Reunification Express (Hanoi-Ho Chi Minh train) and most open bus tours, Hue is very much on the tourist trail in Vietnam. Although we hadn’t read very good things about it from other travelers, we figured it was worth it to stop there for at least a day; if anything, we could break up the journey and get a little culture and history lesson. Unfortunately for us, the weather gods didn’t cooperate. From the moment we arrived until the moment we left, it was pouring rain. As we both have tons of experience trying to have a good time in inclement weather (thanks, music festivals! ), we decided to brave the rain and head out to explore a bit. Crappy weather never stopped us from having a good time. After an all-night train journey, the first order of business was getting food and coffee. A few blocks from our hotel, we found the Waterland bar & restaurant. 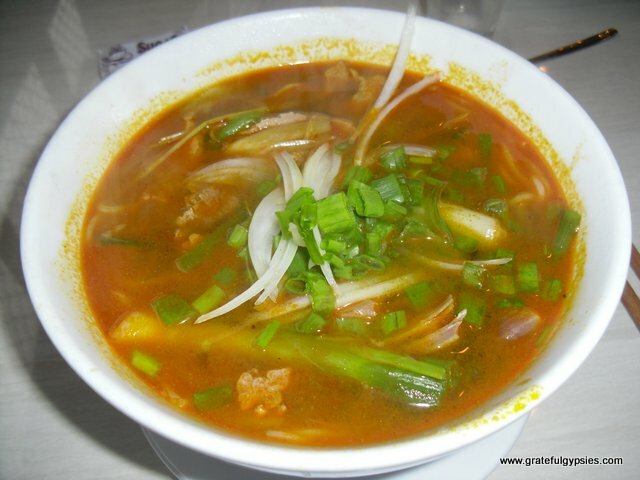 Of course, we had to try a bowl of the local specialty – bún bò Huế – a spicy beef noodle soup. 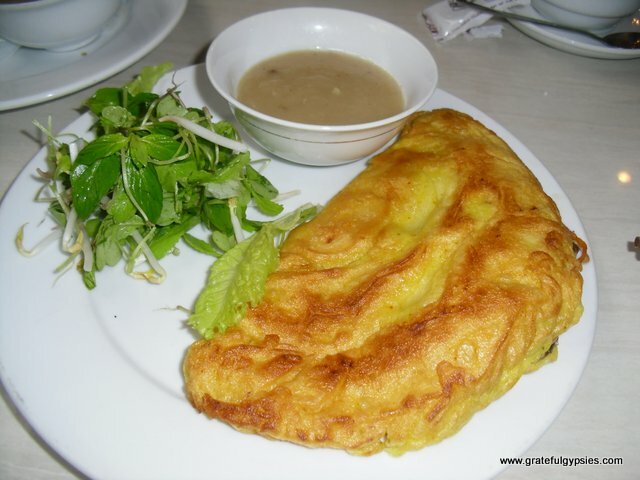 We also ordered up some bánh xèo – a Vietnamese style pancake stuffed with pork, bean sprouts, green onion, and more. With a few cups of Vietnamese coffee to wash it all down, we were ready to make the best out of a rainy day. 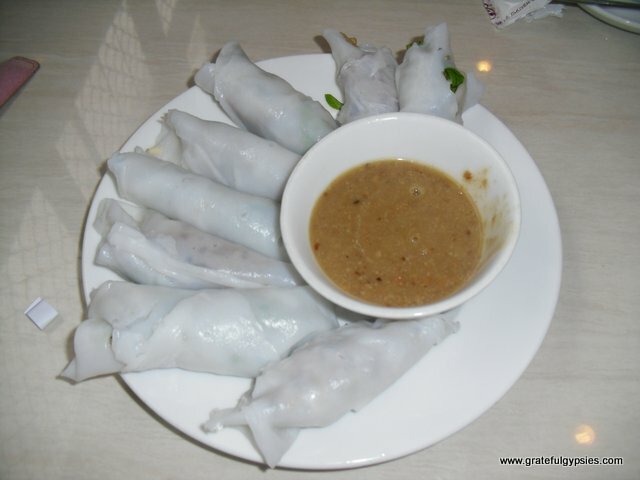 Fresh spring rolls – a classic Vietnamese appetizer. Amazing bun bo hue noodle soup. Braving the rain on the walk into the Citadel. 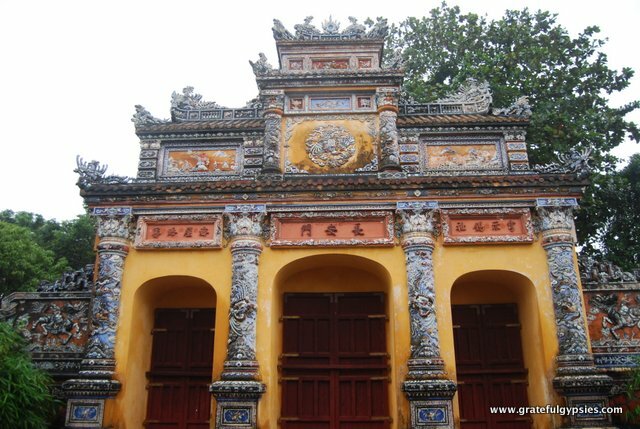 The main attraction in Hue is the former Imperial Citadel, a massive complex of temples, pavilions, museums, and more. Although much of the area was destroyed in the wars with both France and the US, some of the buildings are still in surprisingly good condition. We explored the grounds for about two hours, and while it was interesting, we eventually just got sick of being cold and wet. Not wanting to deal with the incredibly obnoxious motorbike drivers, we walked ourselves over the bridge for a glimpse at the Perfume River. On a nice day, a short cruise along the river could be a nice way to kill a few hours here, but that just wasn’t in the cards for us. One of the many fancy gates inside the complex. At this point in our day, we were both soaking wet, cold, tired, and hungry. When we stumbled upon the DMZ Bar showing basketball and soccer on TV and its menu with Western food and a happy hour, we were ecstatic. While we normally prefer to eat either street food or in local places, sometimes you just need a little slice of home when you’re traveling non-stop like we are. With a table full of potato skins covered in cheese and bacon, ravioli, chicken parmesan, and a few cocktails, we were smiling from ear to ear. When reserved for situations such as the one we found ourselves in on this rainy day in Hue, comfort food and a nice strong drink can truly be a godsend. 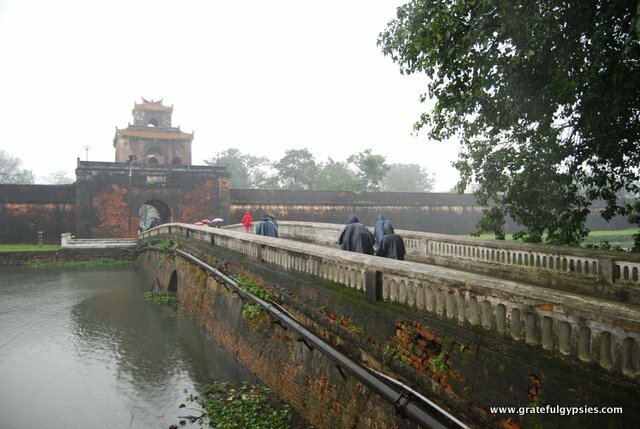 Other than the Citadel, Hue doesn’t have a whole lot of attractions aside from a handful of tombs. Although we would have liked to visit these, the constant rain and the fact that we were already almost half-way through our visas forced us to pass on this particular trip. Looking back on it, this is one situation where it probably would have been worth it to pay for a day tour. Despite my absolute hatred of day tours, they just make sense sometimes. Instead of walking ourselves to and from the Citadel and skipping out on the tombs, we could have easily done all of them from the comfort of a bus for just a few more dollars each. Oh well – live and learn. Home for the night in the Valentine Hotel. Thankfully, we had a nice hotel to call home for the night. Not wanting to go back out in the rain, we opted to stay in and relax. In the morning, we enjoyed a nice free breakfast, hit the ATM (the first stop of many painful experiences trying to get cash), had some coffee, and waited around for our bus to Hoi An. Had the weather been a bit better and had we not been in a rush to move our trip south, we definitely could have stayed for at least another day in Hue. 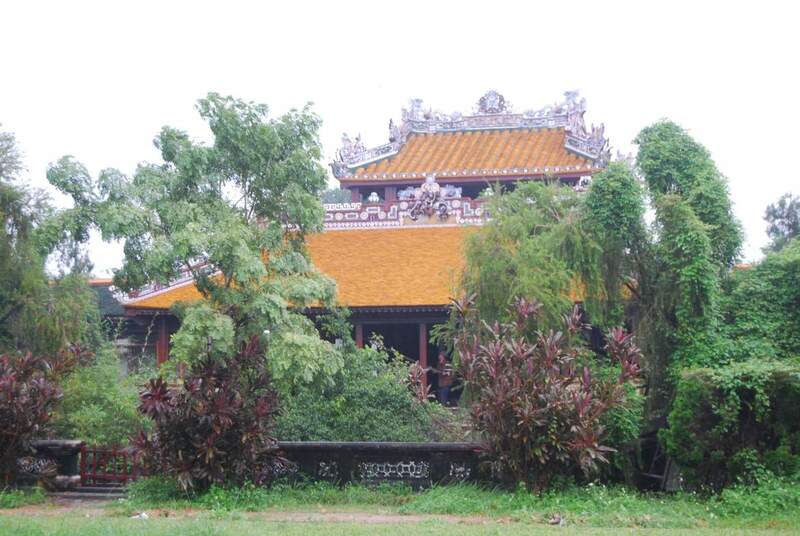 The ancient capital of Hue. 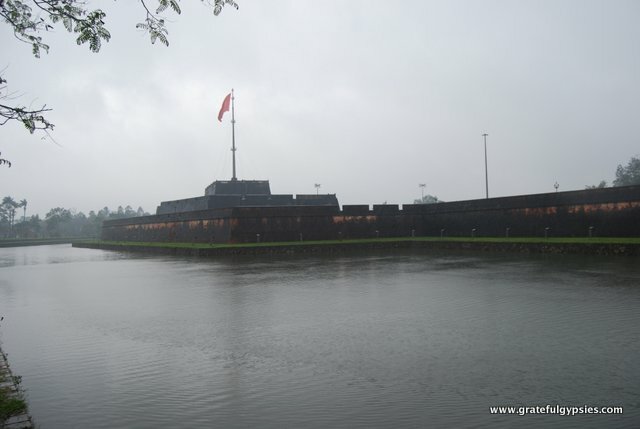 Transportation: We took the overnight train from Ninh Binh to Hue. This is part of the Hanoi-HCMC route and as such, soft sleepers tend to sell out. We got hard sleeper tickets, and we had the whole room of six to ourselves for about $60 total. It was double the price of sleeper buses but much more comfortable. 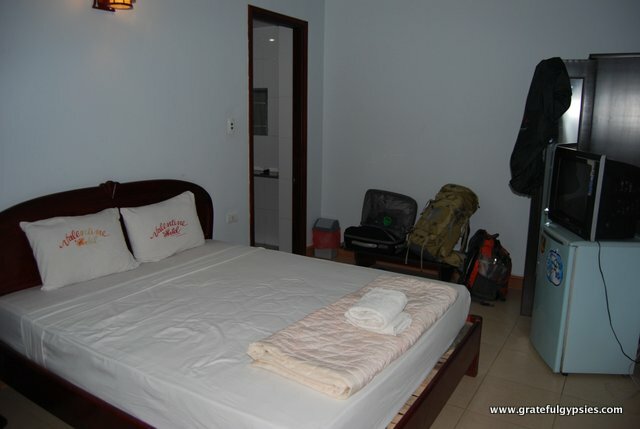 Accommodation: For our one night in Hue, we stayed in the Valentine Hotel where we got a double room with a private bathroom and free breakfast for just $13. The staff were incredibly helpful and friendly, and we’d definitely recommend them. Getting Around: As we were only there for one day and the Citadel wasn’t that far from our hotel, we just walked around. You will, however, find plenty of motorbike drivers ready and willing to give you a ride. 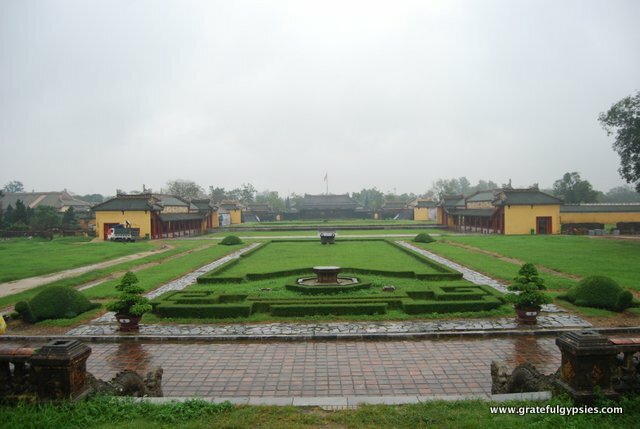 Activities: The main attraction is the Imperial Citadel ($5/person) – a series of pagodas, temples, gates, and all that good stuff. A lot of it is in ruins, but it’s still worth a visit. There are also quite a few significant tombs in the area, as well as the former DMZ (demilitarized zone), but we didn’t check any of those out due to time constraints. Food/Drink: You’ve got to try the bun bo Hue (beef noodle soup) here, and it’s everywhere. We really enjoyed our brunch at the Waterland restaurant ($10 for two) for Vietnamese food, and we also splurged on some comfort food at the DMZ bar ($17) with pasta and cocktails. There are plenty of other bars in town, but we just didn’t want to go back out in the pouring rain to check them out. Recommended Time: If you’ve got the time and the weather isn’t terrible, two days here would be fine. If you have to cram it all into one day like we did, go ahead and pay a few extra bucks for a day tour – we wish we would have in this case. Total Cost: Since we only stayed one day here, we grouped it together with Ninh Binh. For transport to and between these cities, two nights in a hotel, and all our food, drink, and activities, we spent $214. Keep in mind that the train tickets alone were $60 total, and you’ll see that this was a cheap part of the trip. The best cure for boredom! Follow along on our adventures with posts sent directly to your inbox!